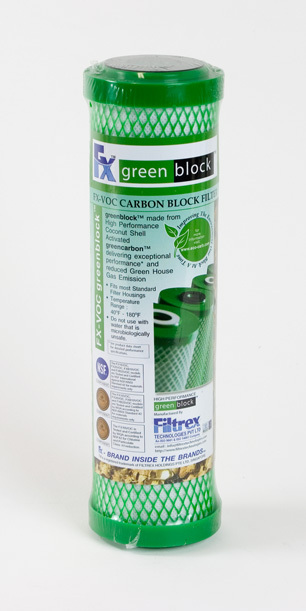 Modern carbon block filters are made with extremely fine powdered carbon held together by plastic binders.Their overall effectiveness depends on the carbon used, the binder used, the heat applied in the process, and other factors. Starting with the best carbon doesn’t always guarantee the best finished product. A common request we get from customers is for filtration products that don’t contain plastics. People often ask for filters with stainless steel rather than plastic housings because plastic housings “will leach plastic into the water.” We point out that the hard plastics used in filter housings are probably the least likely part of the device to put plastic into the water. Even axial flow filter cartridges, made with granular carbon, use a plastic container for the carbon. Carbon block cartridges, by far the most popular, the most common, and in most cases the most effective, have plastic end caps, plastic center cores, plastic webbing and screens, and most importantly, plastic binders to hold the carbon in place. Binders, the adhesives that hold the carbon block together, are never mentioned in sales literature, but all carbon block filters use plastic binders. Various manufacturers may use different binders and names you hear are pEVA (polyethylene-vinyl acetate), LDPE (low density polyethylene), GUR 2126, KYBLOCK pVDDF (polyvilene fluoride), and more. The powdered carbon used for carbon blocks would not work without the plastics holding it in place. If you’ve ever cut apart a carbon block filter you know the cartridge wall has the density of a board. It is a solid structure made of very finely ground carbon particles fused together with a plastic glue. Binders are an important part of carbon block filter engineering. The effectiveness of the carbon depends not only on the selection of the carbon type, but also on the mesh size of the carbon, the binding material, the amount of heat used in the binding process and how it is applied. The use of plastic binders is discussed in some detail in an informative two-part article titled “Catalytic Carbon: Fundamentals” and “Catalytic Carbon: Impact of Binder and Processing Conditions on the Catalytic Activity of Carbon Block Products” by Evan Koslow, Rasmina Musovic, and Esko Musovic which appeared in successive issues, October and November 2018, of Water Conditioning and Purification magazine. To complicate matters, the authors explain, the effectiveness of the finished carbon block depends not only on the effectiveness of the raw carbon material used, but also on the extent to which the carbon is fouled by the binding process. In other words, a moderately effective carbon may make a better carbon block filter than a top quality carbon if it withstands the manufacturing process better. The takeaways of all this are, first, people looking for a plastic-free water filter in today’s residential market will not find what they are looking for. Second, all carbon block filters are not created equal, and, third, the generalizations we make about carbon performance (bituminous carbon is better at chloramine removal and coconut shell carbon is a superior product for VOC treatment) don’t necessarily apply to carbon block filters.